You have to go back to the 2010 NBA Championship before you find the most recent championship series that didn't involve LeBron James. So, his decision to leave the Cleveland Cavaliers this summer was a big deal. It's the end of an era for the Cavs and the start of a new one for the Los Angeles Lakers, where he'll play next season. 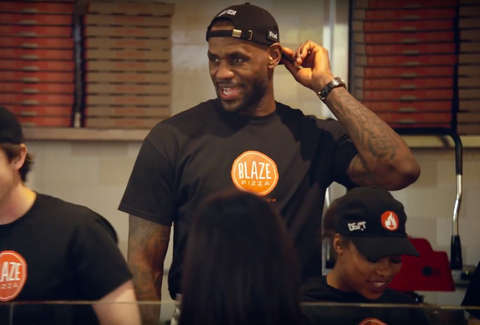 Blaze Pizza is ready to celebrate the arrival of LA Bron. (It probably doesn't hurt that James is a major stakeholder in the fast-growing company.) On Tuesday, July 10, 50 Blaze locations in southern California will be giving away full pizzas for free. The participating restaurants are scattered around the area, including Anaheim, Culver City, Hollywood, UCLA campus, and many other shops around the greater Los Angeles region. "King James coming to Los Angeles is definitely worthy of celebration, and we can think of no better way than by hosting a giant pop-up pizza party with communities throughout the area," Shivram Vaideeswaran, Blaze's chief marketing officer, said in a statement. James even tweeted about, appearing to tease a possible appearance at the Culver City location. It wouldn't be the first time James made a surprise appearance at a Blaze location. He worked a location in Pasadena in a "disguise" on a day off previously, telling customers he was a Blaze employee named Ron. Though, many people figured it out because his only disguise was an apron and a backward hat. The pizza party lasts from 2 to 5pm local time on Tuesday. It's only available for dine-in, and you can't call ahead or place an order through the app either. It's probably going to be crazy. (Be sure to tip, because this is going to be a madhouse for the staff.) If you ask nicely maybe someone will hand you a pizza in the style of LeBron giving JR Smith the "what the hell" face.